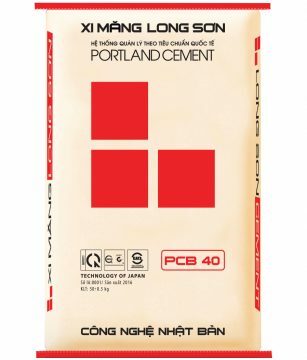 Portland Cement Blended PCB 40 branded Long Son helps to increase the flexibility of concrete, waterproof, impregnation to environment; strengthen the lifetime of constructions, and is very suitable with the tropical climate conditions of Vietnam. Advantages of Portland Cement Blended PCB 40 branded Long Son. Quality of Portland Cement Blended PCB 40 branded Long Son is always ensured to be stable. Especially, cement compressive strength is always in over-graded rate that is an advantage to consumer. With the high development of initial compressive strength (R3, R7), Long Son cement assists in shortening the construction period with speeding up the process of formwork removals and increasing the compressive strength of the output concrete. Sulfate resistance at a high rate is good for underground, underwater works and salinity area. On the other hand, heat emission during freezing is low that is favorable for working with mass concrete. The content of free lime and MgO in cement is low, so it’s not be expanded after the construction. Products from concrete and mortar using Long Son cement will have no shattering sign of concrete block & block wall texture after putting into use. The content of total alkali R2O in cement is very low <0.6%, so it eliminates the causes leading corrosion & demolition of concrete and wall structure for works. Portland Cement Blended PCB 40 branded Long Son is suitable for concreting the roof, beams, columns with high durability.